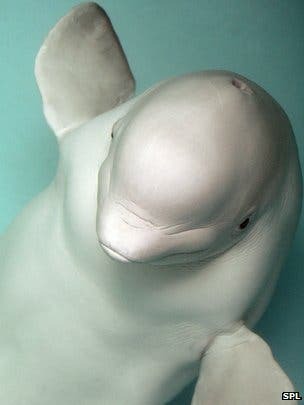 US researchers were shocked to discover a beluga whale that spontaneously emits sounds very similar to those we humans produce. Scientists have known for quite a while that dolphins can be taught to mimic human voices, but no animal has ever tried to do that spontaneously – until now, that is. It all started when the nine-year old whale called Noc was heard emitting sounds octaves below normal ones. But the first problem was that no one knew where the sounds were coming from (hear the actual sounds on BBC). Whales are sometimes called the ‘canaries of the seas’, because of the high-pitch sounds they emit. When a diver at the National Marine Mammal Foundation in California surfaced saying, “Who told me to get out?” – the rest of the team had a hunch what they were dealing with. After they identified Noc as the culprit, they immediately made the first recordings of this behaviour. They found that not only vocal expressions resemble human ones (with three bursts per second on average), but the whale also made some human like pauses between the bursts, which takes things to a whole new level. They then rewarded NOC for the speech-like sounds to teach him to make them on command and placed a pressure transducer in his naval cavity; using this device, they found that Noc was able to rapidly change the pressure within his nasal cavity to produce the sounds. However, in order to do so, he had to over-inflate the vestibular sac in his blow-hole, which normally stops water from entering his lungs – human mimicry is no easy task for Noc.